The long running community-oriented Ultimate Jam Night residency at the World Famous Whisky A Go Go has announced the second annual Ultimate NAMM Night for Saturday, January 26th at the Hilton Anaheim C/D Ballroom. The free show will feature all star performances by Mr. Big and The Winery Dogs bassist Billy Sheehan, Poison drummer Rikki Rocket, Cinderella drummer Fred Coury, Bon Jovi guitarist Phil X, guitarist Steve Vai, Whitesnake and Dio guitarist Doug Aldrich, Living Colour guitarist Vernon Reid, Vanilla Fudge drummer Carmine Appice and more. Tickets are only available through participating sponsors at certain booths during the NAMM show Thursday (Jan 24th) through Saturday (Jan 26th). Tickets will be distributed based on a first come, first served basis and distributed to individuals only with a maximum of two tickets to any one individual. 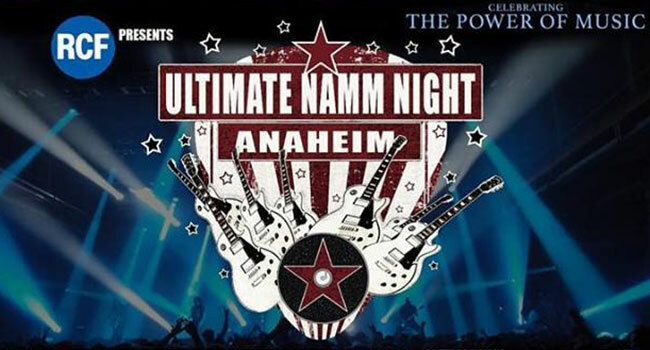 Ultimate NAMM Night – The Power of Music is sponsored by Al Bane For Leather, Ampeg, Axis, CAD, Coffin Case, D’Addario, Drum Workshop (DW), Fender, Gear Secure, Mezzabara, Morley Rock N Roll Industries, Royal Entertainment and Wedgie. There will be more than 80 performers including full band performances by Flotsam & Jetsam, Marco Mendoza’s El Trio and The Sweet.